The M12™ Charger accepts all M12™ batteries, so you will always be prepared and productive. Power up your compact batteries in 30 minutes and extended capacity batteries in 60 minutes, without the need for extra charges on the jobsite. 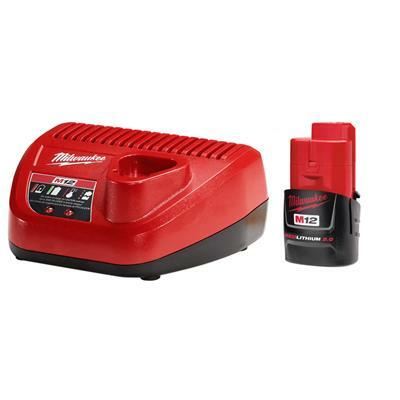 The Milwaukee 48-11-2420 M12 REDLITHIUM™ 2.0 provides up to 2X more run-time, 20 Percentage more power and 2X more recharges than a standard Lithium-Ion battery. REDLITHIUM™ 2.0 also delivers best-in-class performance in extreme job-site conditions. With Milwaukee durability built into each pack, the REDLITHIUM™ 2.0 battery operates cooler and performs in climates below -18-degree C/0-degree F with fade free power.